Why is the Horizontal is Better for Batting Trainers? The Topic: What kind of hitting machine is the best? 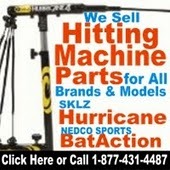 The BATACTION, SELF-TRAINER, hitting machine is a horizontal-action hitting machine. The patented Batction Machine and its patented ancestors, the HIT2WIN TRAINER and the HITTING STICK TRAINER , stand alone in the market place when it comes to rod-controlled, horizontal-action hitting devices. Coach Nick Dixon pioneered this innovative concept in the late eighties. The products benefits have made it one of the most popular youth coaching tools on the market today. It offers two distinct advantages over the many vertical-action machines that you see frequently advertised. 1) ACCURATE FEEDBACK- When a hitter swings the bat, it is extremely important that he or she know the quality of the swing. It is this feedback that allows the batter to self-evaluate and determine the level of performance. If you swung the bat 100 times and regardless of the quality, power, and angle, of your swing, the ball went up 100 times in a row, would you feel like a better hitter? If you dont think that sounds like much fun, stop to think, that is exactly what you get from a vertical-loop apparatus. On a perfect swing the ball goes up. On a poor swing the ball goes up. Wouldn't that get boring for you? Could you tell how many line-drives, pop-ups, or groundballs you hit in those 100 swings. With the BATACTION, SELF-TRAINER, machine, you can read your contact on every swing. You get instant feedback on every swing. There is no better way to learn hitting. Plus, you'll never get bored seeing how many line-drives you can hit. The BATACTION, SELF-TRAINER, offers fun practice, instant gratification, and true quality assessment. Youll never need anything more out of a hitting machine. time, an occurrence that I like to call bang-time is what allows you to get that full sweet-spot sensation. I know you have heard what a hitter often says when he experiences this sensation. He will smile and say, Man, that felt good! I got every bit of that ball with that swing! 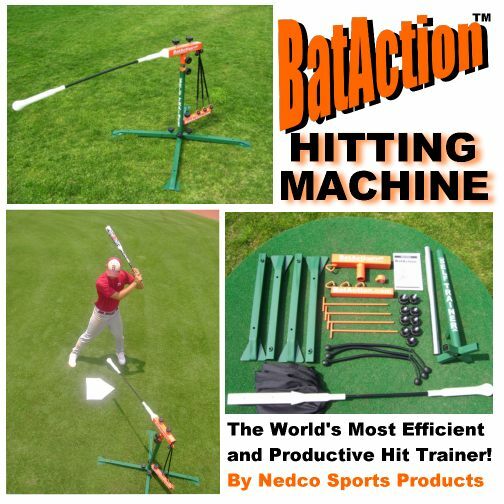 The BATACTION MACHINE allows you to get every bit, of every ball, on every swing. If you take a line-drive swing, the ball will travel on a line-drive trajectory off your bat. You will get the full sensation of hitting a real line drive. Only The BATACTION MACHINE, with its horizontally suspended ball, offers the batter this sensation in practice swing. The vertical-loop machines have a rope, cord, cable, string, or strap that restricts the balls movement off the bat. The vertical connecting cable is going to jerk the ball upward and off the bat as you swing through the strike zone. The cable stops the forward motion of the bat, every time. This cheats the hitter of the ability to judge his swing bang time and prevents him from getting the great full-pull sensation of maximum bat-to-ball contact time. If you want to practice hitting line drives and grounders, buy a machine that will allow you to do so. The BATACTION MACHINE is just such a machine! MACHINE owners such confidence hitters with high self esteems. like hitting a real baseball. Sets up in only minutes without tools. Quick and easy height adjustments..
Weatherproof paint finish holds up to elements. Composite Shaft Controls Ball and Flexs Upon Impact. Heavy-duty top quality steel construction. Great For Team and Home Practice Year-round. Comes with three BatAction powerbands. Two-Year Warranty on all metal parts. Built to last and last. 1 Full Year Warranty on Ball Impact Head. Risk Free Purchase Guaranteed by a 90 day Money-Back Guarantee.